Chameleons don't sing or call like birds and frogs, or engage in any type of verbal conversation at all; but they are effective communicators. Chameleons communicate three basic things to predators and other chameleons: territorial messages, receptive messages and nonreceptive or deterrent messages. They send these messages by changing their body language and colors. Contrary to popular thought, chameleons do not change colors or patterns to blend with their surroundings. Rather, their color change is primarily for intraspecific communication. Most calm, content chameleons display a base color of green, often with other marks to break up their outline. When a chameleon wants to change colors, he redistributes the pigment in the chromatophores -- small structures located in the skin. When the pigment in these chromatophores moves, a variety of colors show through. 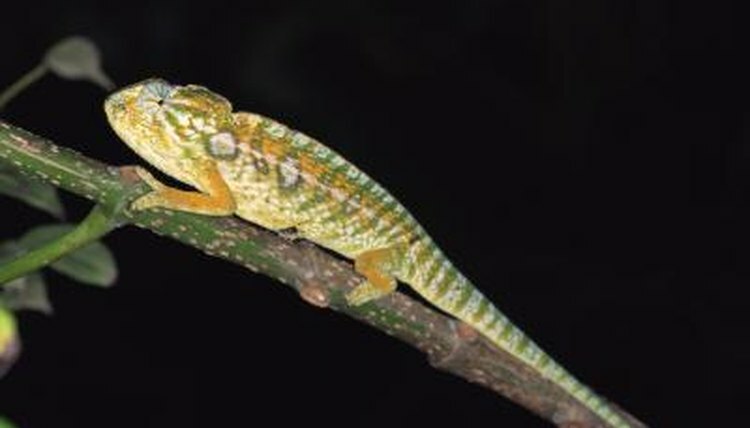 Chameleons also thermoregulate by changing colors. They turn darker when they need to warm up and paler when they need to cool off. Screameleons: Why Do Panther Chameleons Turn Dark?